These are different from the large, stuffed green peppers with rice - which is a main dish. These peppers are a delicious side dish and the filling is quite spicy - it has a nice tang to it! Once again, this recipe is quick and simple. If you cannot find Greek anthotiro where you live, then you can use ricotta or order from the Greek Food Store on this site. Remove the tops of the peppers and, with a sharp knife, remove the seeds. With a fork, mix the feta, anthotiro and chilli sauce. Make a round hole at the top end of each pepper and fill them with the cheese mixture. Place the stuffed peppers in a shallow oven dish and pour the olive oil over them and add salt. Spread the garlic in between the peppers. Bake in a pre-heated oven at 180 degrees for 30 minutes. i'm not a big spicy food lover but i love these especially when they are stuffed with butter. Hummm... this recipe sounds and by the pics looks delicious. 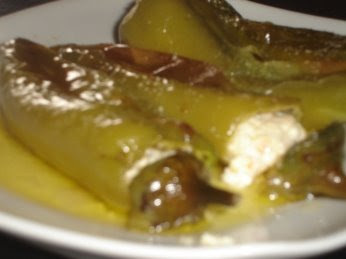 I love green peppers and feta cheese but I never tried them toguether, I guess I should try this one. I recently had these on holiday on a Greek island - and they were REALLY nice; however, there was no spice kick to them; as far as I know the only cheese inside was Feta. these look good. what are they called in greek?